Luxury hotel is set amidst Miami's cultural center. Guests can enjoy on-site pool and casual dining at Bay View Grille. Traditional décor accents this luxury hotel. Close to beaches and golf courses, this hotel also features a pool. Comfortable, contemporary guestrooms await guests of this hotel. Also features complimentary internet and pool. Contemporary retreat boasts an infinity-edged, heated pool and views of Miami Beach. Guests can dine at Deco Blue. Relaxing, luxury accommodations await guests of this hotel. Located near world-famous Doral golf courses. Comfortable, contemporary hotel features 112 suites, pool, heated spa, gym and sports court. Comfortable, contemporary hotel is located near world-famous Doral golf and includes heated outdoor pool. Contemporary suite hotel offers exclusive access to the Doral Golf Resort & Spa. Hotel offers spacious, comfortable rooms, state-of-the-art fitness center and outdoor pool. Hotel features 300 comfortable guest rooms, casual dining at Whitney's Restaurant, outdoor pool and fitness center. Hotel features spacious 1-and 2-bedroom suites, on-site pool and state-of-the-art fitness center. Spacious guest rooms include a large, flat-screen TV. Also features an outdoor, heated pool and on-site fitness center. 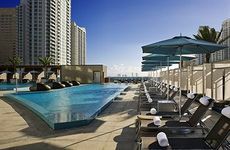 Situated between Miami and Fort Lauderdale, this hotel offers a great location, 300 rooms, and many activities. This 18-story, 484-room hotel's floor-to-ceiling windows offer views of the city or the ocean. This sophisticated hotel, located on Biscayne Bay, features a spa, fitness center and a two-acre pool terrace.